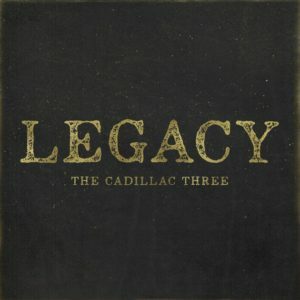 The Cadillac Three – Legacy: The Southern rockers are back with their third album and they’re not slowing down! Following their successful US and Europe tours, The Cadillac Three are definitely not taking any breaks from music. Only a year after releasing the successful Bury Me in My Boots album, they are back with new music and it is out tomorrow! The new album, Legacy, written on the tour bus is full of rock and life-inspired stories, and will not disappoint the ever-growing international fan base. The album starts off with heavy guitar, faster pace and a lot of swag. This song, Cadillacin’, will fit the band’s energetic live shows extremely well and it showcases Johnston and Mason’s talent to write songs that suit their live performances. Tennessee, the second song on the album Legacy, shows absolutely no way of slowing down. The lyrics follow Johnston on the road and his desperation to get a good date night with his girl, and some whiskey and vinyl. Somewhat innocent lyrics are interpreted with a very loud and gritty guitar, something that will remind you of old school US rock. You can bet that this song alone will make you want to queue up ahead of the band’s live show. Songs Hank & Jesus and Ain’t That Country portray the band’s soft side and refer back to their roots. The passion for music and thankfulness the band has towards where they come from ooze from Johnston’s vocals. Although slower songs, the arrangement may seem simple but is very well done to enhance the lyrics especially of Ain’t That Country. Taking into consideration last year’s UK tour, The Cadillac Three are playing better and stronger every year. They have this great ability to instantly fill up the crowd with easy-going and feel-good atmosphere. The first single from the album, Dang If We Didn’t, brings this feel-good atmosphere to the album and is a great summary of what you can get at one of their live shows. Warning, do not skip American Slang. One of the best songs on this album, this mid-tempo track with soft rock base but radio friendly sound highlights the importance of remembering the things that bring people together rather than drive them apart. Perfect sing-along song for audience of any background. Long Hair Don’t Care, an anthem to everybody who is a little bit on the easy-going side and does not get bothered by people. Kind of speaks directly to me and every other country music fan out there. Live setting arrangement of this song makes it sound even more groovy and cool than The Cadillac Three usually are. Acoustically-driven ballad Love Me Like Liquor offers a genius mix of Johnston’s gravelly voice with soft vocals of Lori McKenna. To Johnston, this song sounded like a poem when he first heard it and it is a feature upon which the final recording was made. The album finishes off with a soft guitar led song Legacy. This ballad is far away from the rock and roll start to this album, however it shows progression and a very mature sound for the band. Hearing the band cut a song like Legacy can only keep you wondering how much more their sound can grow. A sweet ending to a wonderful album. The album immediately takes you into the old school rock and roll and starts off with heavy guitar sound, something we all look forward to when it comes to The Cadillac Three. As the album progresses, it will take you on a journey through your roots with songs like Ain’t That Country, all the way to new and mature sound of the band with excellent tracks like American Slang and Legacy. There is no wonder that The Cadillac Three are becoming hugely popular in Europe, when through songs like these, they introduced music that goes beyond one’s background and culture. Very clever album. Old Dominion: We chat to lead singer Matthew about ‘Happy Endings’, their debt to their fans and their whirlwind first visit to the UK. Kip Moore – Slowheart: The highly anticipated record from ‘The Guitar Man’ doesn’t disappoint.